Many city dwellers can only dream of dry, secure garages and similar storage space. Enter the Cycloc Endo which continues the marque's penchant for stylish, yet practical solutions for keeping one's pride n' joy indoors without flouting health and safety regulations, detracting from the décor and/or inducing acute domestic disharmony. The Endo is a hinged hook that cantilevers to accommodate different rim and tyre diameters and will support bikes with tyres up to 2.3 inches in its generous, rubberised channels, defending walls from unsightly marks. Like most good engineering, simple design and clever materials are recipes for minimal strife and most of us will have it firmly attached to the wall in thirty uninterrupted minutes, allowing a further five or so to fully (though not literally!) digest the instructions. Thoughtfully the kit includes a drilling template, minimising error and moreover, faff. However, it's worth noting the design has a maximum 20kg payload. Bikes up to 15kg can supposedly be hung as loftily as ceilings and rider stature allow, but anything heavier must rest with its rear wheel on terra firma. Personally, my limit's nearer 13kg, especially if the Endo is used in conjunction with a slender U lock since my fully equipped Univega felt as if it could rip free with costly consequences. Chunky composites look stylish and keep strain to an absolute minimum, making it a better choice for partition walls so beloved of house conversions or walk-in cupboards for those lucky enough, or needing to hide bikes from prying eyes. Ours was an off-white, which blended nicely with calico walls, though it developed a grimy patina within a matter of days. Thankfully, there are several vibrant alternatives including green, orange, blue, red, violet, yellow and matt black. The Endo is well-engineered and very easy on the eye but there are more secure solutions for sheds, garages and outbuildings. This is definitely attractive indoor bike hanging rather than attack-proof outdoor storage. Leaseholders should read the terms of their tenure very carefully and experience suggests those renting privately on assured short hold tenancies would be ill-advised to install one without their landlord's consent. 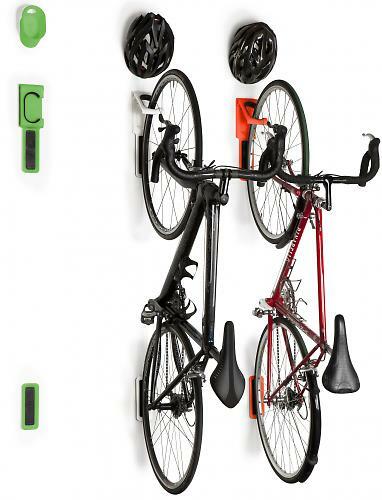 Nicely made bike storage that's easy to install and looks good. secure four point fixing, fixings included. points, front & rear wheel pad included. Discrete fold flat facility, only 3.2cm thick when folded." Composite construction, maximum 20 kilo payload, hollow hinge locking function, composite construction, "rubber" contact points, accommodates wheel sizes between 16 and 29 inches, 650-700c. Includes screws and rawl plugs. Composites should live long and happy lives. Surprisingly light, yet reassuringly robust. Nice to use so long as it's installed at a convenient height. Overall, the Endo is an excellent solution to indoor storage in homes/offices. Easy to install and on the eye, there's really nothing to dislike, though some caution's required when partition walls host heavier bikes and gamekeeper type systems are better options for owner occupiers in rougher areas. Lovely design, aesthetically pleasing, nicely made. Nothing but keep an eye on the payloads and there are better options for garages, sheds and similar outbuildings. I bought one of these a few months ago as I have to store my bike in my flat and away from the 'helpful' hands of my amatuer mechanic 18 month year old son. Looks very unobtrusive on the wall, holds the bike well and most importantly even passes the aesthetics test from my wife! Very well thought out design. Thank you, kind sir. I was trying to picture how it would work. what's the "Sold Secure" rating then? I need silver or above to combine with my D-Lock to comply with the insurance company requirements.